Hi guys. New to the forum but have learned a lot since joining. Y'all are very informative and I appreciate your willingness to share your projects in such detail. 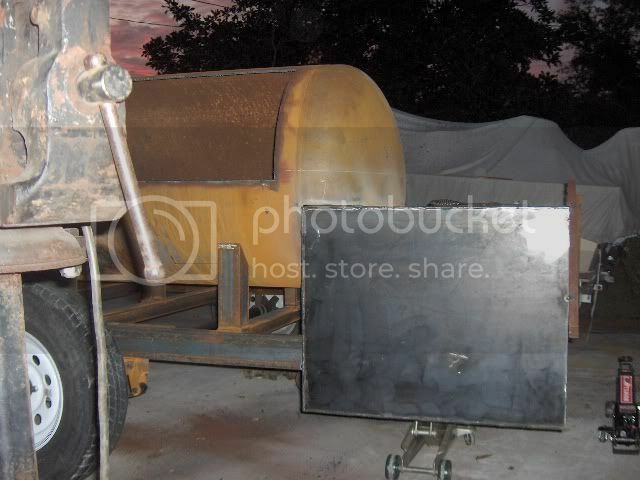 I have just begun my build having recently completed the firebox. I have my propane tank measured and marked and am about ready to start on it. I used the calculator that most of you guys have used and am fairly confident I'm on the right track (thanks to much research on here and studying two of K.A.M. 's builds). I have taken a few pics but don't know how to post them on here. When I figure that one out, I'll give it a whirl. I had a few questions to start things off and was hoping you folks could help me out. First off, when you install SS springs on your handles (assuming the bar isn't SS) before painting, how do you paint that assembly? I considered leaving the 1/2" bar bare until after paint and then putting the springs on with a cap. Next question is cutting the backside of the firebox. Mine is 30 X 30 X 24, 3/8". 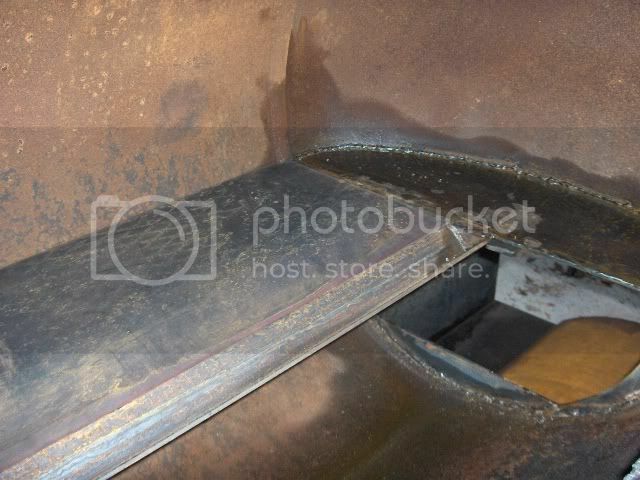 I will mount it 10" up on the CC and wasn't sure if you mark and cut the opening and weld it on before cutting the CC doors, or cut the CC doors first and mark the fire pit from inside the CC then cut and weld it. I have to tell you my pucker cord is drawn pretty tight, worrying about warping the doors or the CC with all that welding on the firepit and the RF plates. 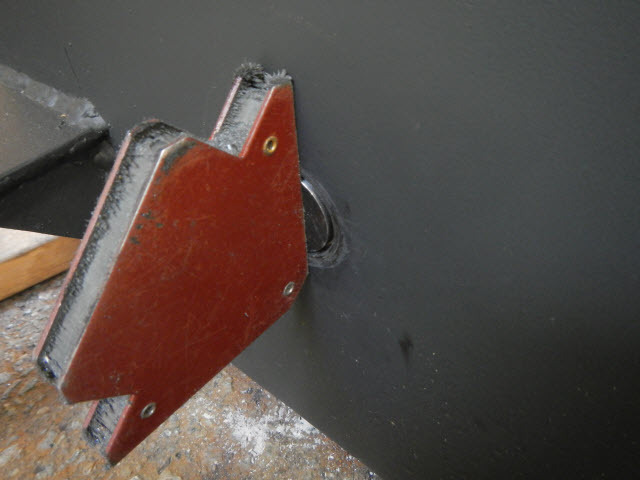 Lastly, has anyone cut doors with a plasma cutter? I have one but am concerned the kerf may be to tight for proper clearance when the pit warms up. Thanks again for all the wonderful info. This is a great forum! Welcome to the ring Flyingj, looking forward to seeing some pics of your cooks and following your cooker project. Here are some links that will help with pics. I know several folks that use the paint first and caps with good results. 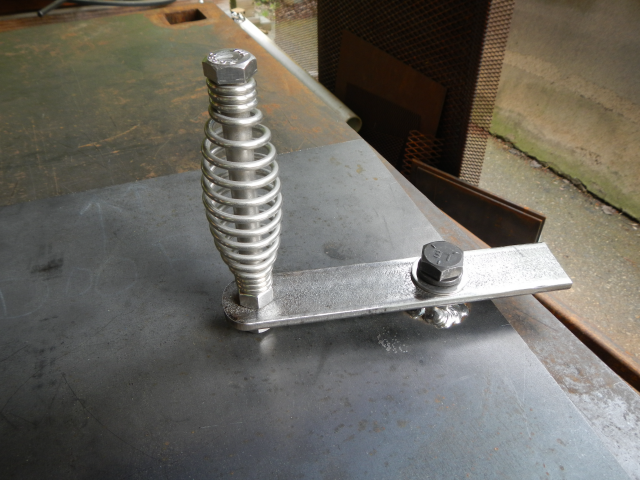 I use stainless rods and just cover the spring when painting. Expect some warping and if it doesn't you got lucky, if it does then fix the problems as they arise. If you are leaving the domes then I suggest you make the opening cut on the firebox then cut your dome accordingly. I like the top of my firebox to be a continuation of the R/F plate so there is no obstruction of air flow. On my comp cooker I cut the dome off of the firebox end, I marked the cooker first then cut it and aligned the two up and cut the firebox second while it was mounted. A lot of folks use plasma torches on their doors the kerf is wide enough just reference mark your doors for left/right top/bottom so they go back in the same way. As far as the spring handle, I used a SS bolt to attach my handle specifically so that I could remove it and paint the door latch. It's just another way of doing it and of course it all depends if your design allows it. Thanks for the replies in helping me get this project off the ground. I don't have experience in participating on forums so please forgive me if I'm not posting in the proper manner. I appreciate the links to help me get my pics posted. I'll work on that soon. I couldn't tell by looking at the pics of your builds if you ran SS bar or not. I haven't welded SS before so will probable use the caps or something along the lines of Smokin Mike's method. One thought is, I'm not sure I want the spring handles rotating freely. Still having a hard time visualizing cutting the firebox opening before notching the dome and fitting it up to the CC for a mark. I will leave the dome on. I'll do some more pondering on that one . Great idea using the bolt. Thanks for the input. This pic is before I added the grease bridge. The bridge was added in this pic. If you need any more help feel free to P.M. me we can talk about the lay out. Thanks k.a.m., a picture is worth a thousand words. I've been out of town for a few days and haven't been able to work on my smoker. Still trying to figure out Photobucket on this ipad so I can post some pics. Oops. It looks like these pics are larger than k.a.m.'s. I thought I had them resized to 640 x 480. Please advise. Right-click on your pics in your post, then click on "properties" and you can see the pixel count. You can do this using the 'preview' tool here before you 'submit' too. saves a lot of headache in editing. You'll likely need to delete the pics in your post using the 'edit' feature, then post pics that have been re-sized (and checked). Thanks Necron. I deleted the pics and am headed back to the drawing board. Had a small warp in the bottom left part of the door. I put cross bracing on to fix it but to no avail. I have since removed the bracing and will address this later after a couple of burns. The hooks and door handle are temporary. This is my mark for the firebox at 9" up. After reading many posts on here, I have decided to come up another inch and cut it at 10" from bottom. I hope to use the original legs it stands on for trailer mounting. 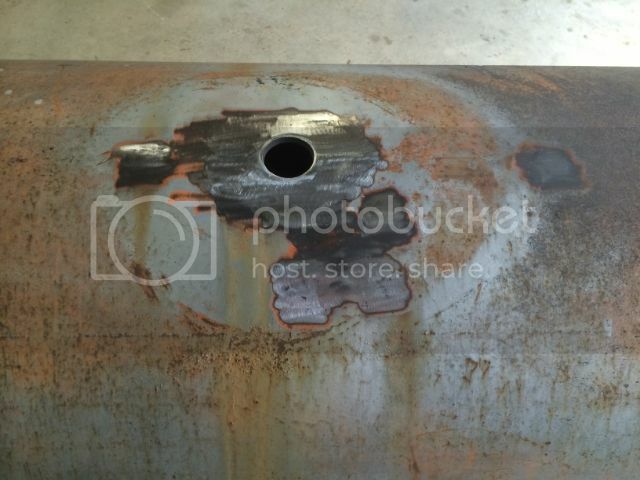 This is the only hole I will have to patch on the tank (unless I screw something else up ). Any tips on getting a good flush patch on this? 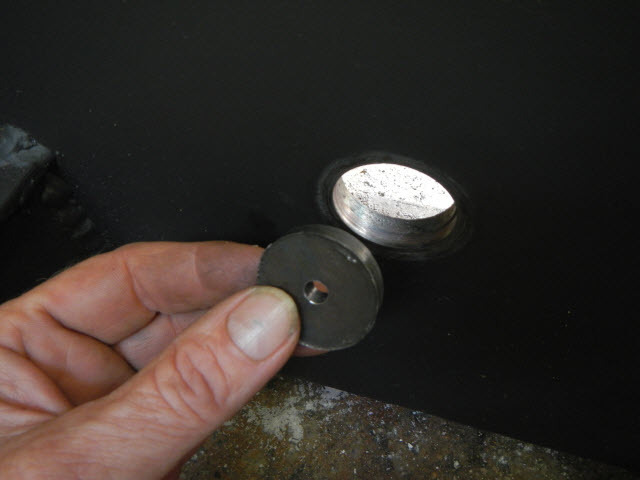 Find a hole saw that will cut a plug as close to the diameter of your hole as possible, weld it in and fill the pilot hole. 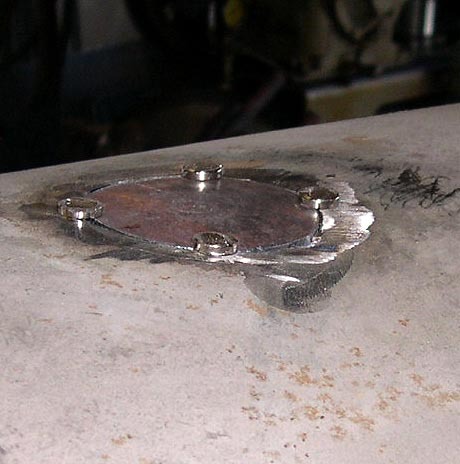 Alternatively, if you can bend a piece of flat bar the same radius as the tank then that would make the patch less noticeable or if you have a scrap piece of tank to cut the plug. Excellent idea Smokin Mike. Thanks for the tip. Should be able to find a piece off of the dome cutout that will match the radius. 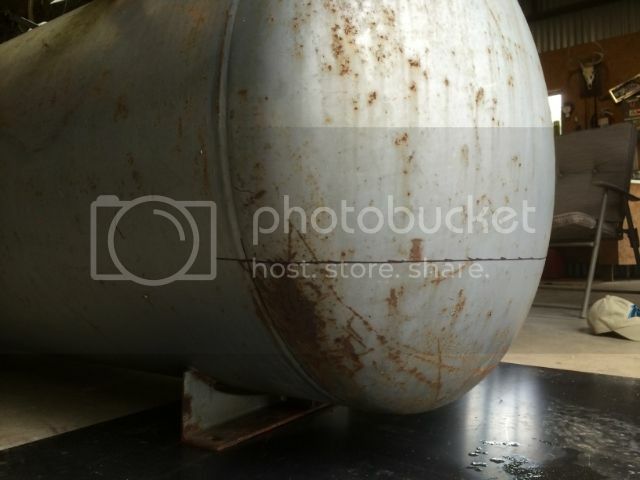 This is how I think about cutting a firebox into a domed tank end. You already made a real nice horizontal line on your tank that will just match the straight top of your firebox. 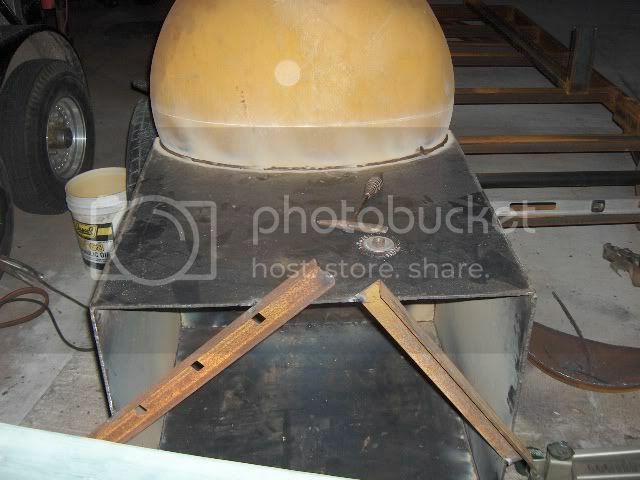 Why not make a nice circular arc on your firebox the same radius as the inside of your cooking chamber? 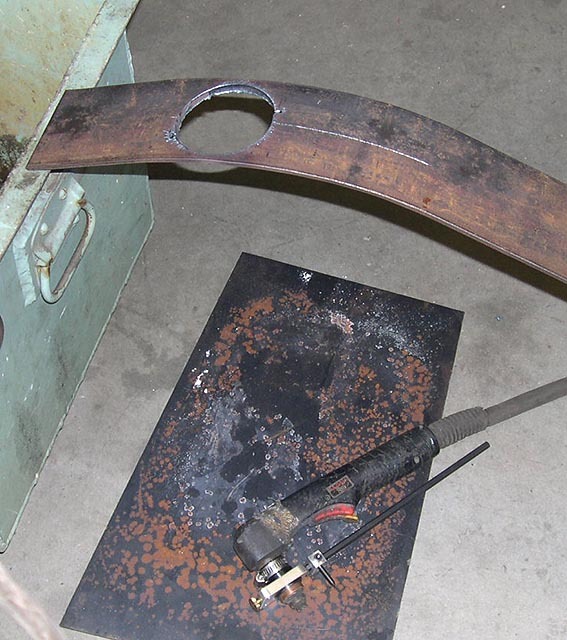 If you want your firebox as high as possible for ground clearance, draw a circular arc on it as wide as possible. 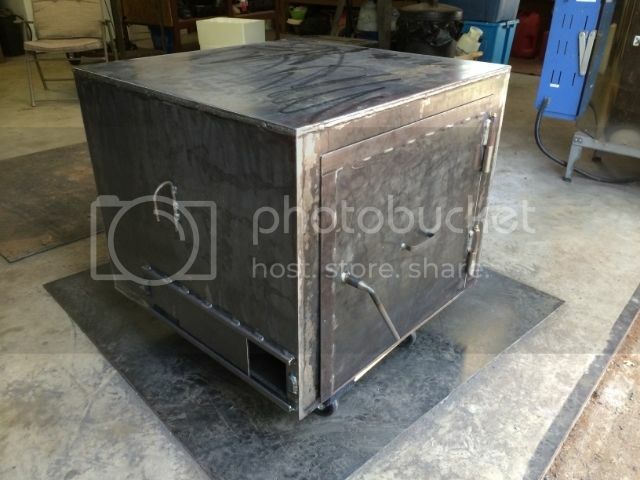 When you cut it out and install the firebox, that will get you a firebox opening that will perfectly match your tank, and will also get your firebox as high as it can go. 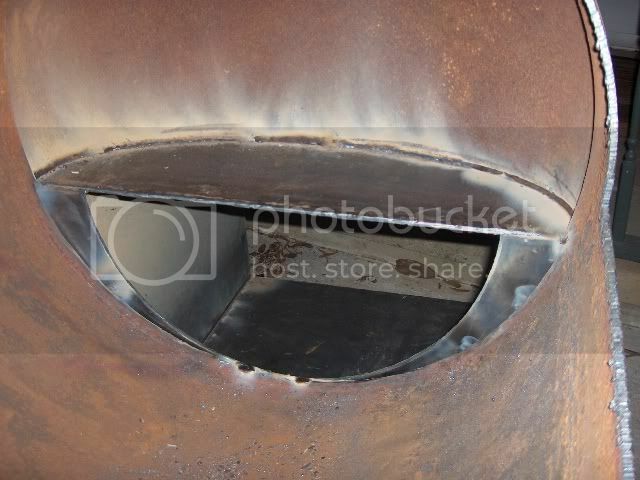 In this pic shot looking into my firebox back towards the cooking chamber you can see the curved cut in my firebox and your eye can follow the curve around and see how it matches the tank exactly. That's what I'm suggesting. Thanks seattlepitboss! That is some nice work right there. 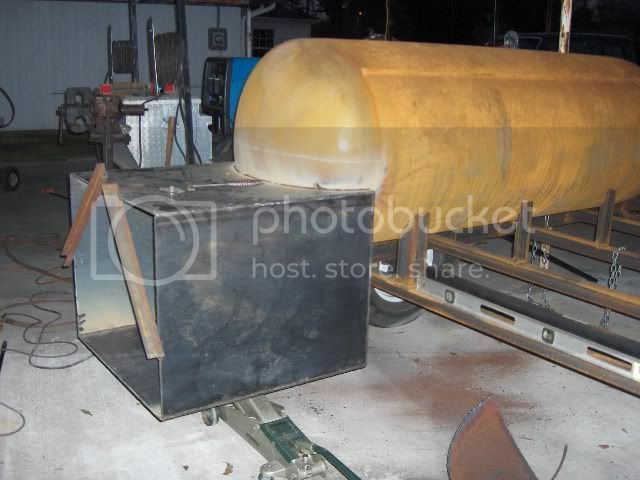 I do plan for the cutout of my firebox to precisely match the dome cutout in the tank but plan on leaving the bottom of the arc on the FB straight across to provide a grease ledge instead of adding one later. That's a great tip for making a plug for my hole. 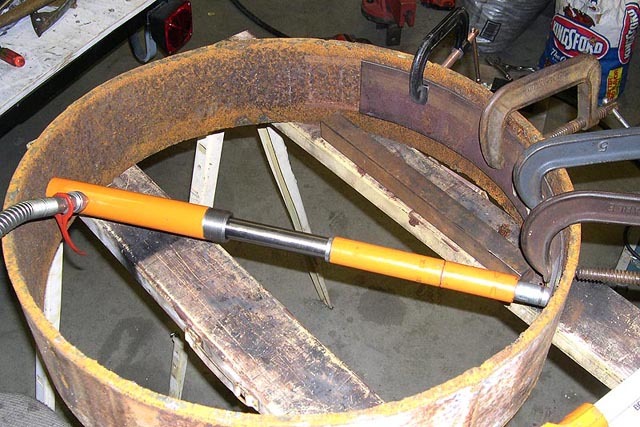 Did you build that circle cutter for your plasma torch? It looks like a dandy! Oh, and I meant to ask about bending the stock. It's 1/4". What's your method to get that nice smooth bend? Thanks again for the help. It bends easier than you might think. Cut your strip the width you need and make it about 6" long. Lay it in the tank long ways to the tanks curve once the doors are cut out and hit it with a hammer. After about six good taps you will have the arc. Nice! After I finally get the nerve up to cut my doors, I'll do just that. When I see a reply like this, I automatically overthink the solution like: where can I find a hydraulic press, etc. . Thanks kam! 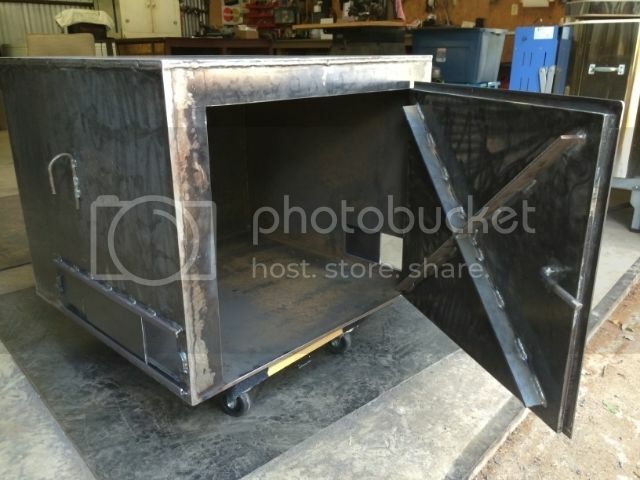 I do plan for the cutout of my firebox to precisely match the dome cutout in the tank but plan on leaving the bottom of the arc on the FB straight across to provide a grease ledge instead of adding one later. Great idea! 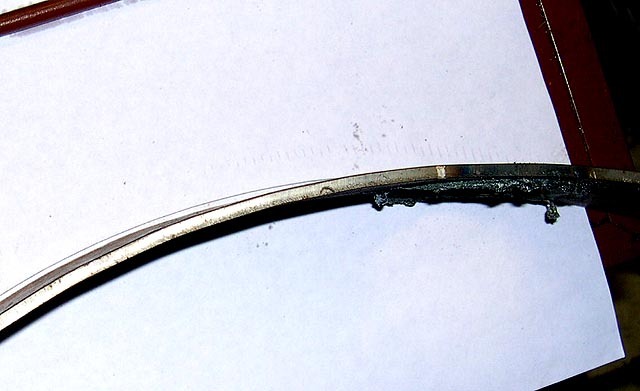 Although I guess I didn't build a grease bridge into my cooker. I've been cooking in mine for almost 3 years now and the bottom under the RF plate is still completely dry. Doesn't seem like grease gets past the RF plate and if it did, it would have to somehow magically run around my washout drain and then run five feet slightly uphill to the firebox. 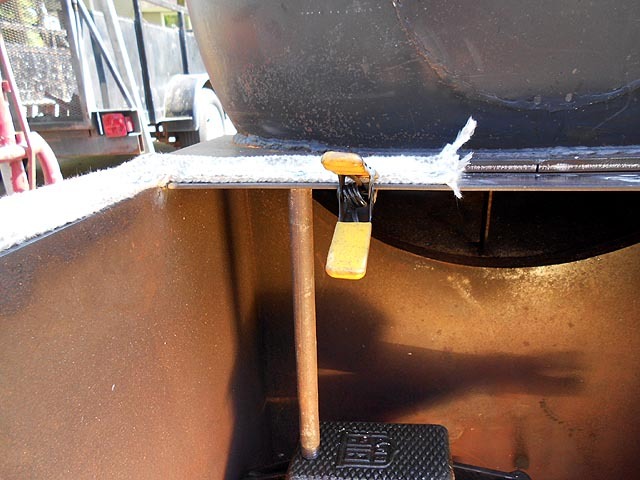 A grease drain at the end of the RF plate farthest from the firebox, now that's very important. No, I didn't build it. Just picked it up somewhere, don't quite remember where. I've had a few of them over the years, but this one works really well for me. There's an Australian company called Tanjant that makes really good circle cutting attachments. Oh, and I meant to ask about bending the stock. It's 1/4". What's your method to get that nice smooth bend? First, use a drawing program to draw a piece of circular arc with the same radius as the OD of your tank. (Is yours 30"?) Print it out. Now you have something you can compare it to as you form the flat bar. I tried a couple of ways. Best would be a powered roll, but the closest one to me is about an hour away and I didn't think it was that important. The main way I did it was by "bump bending". 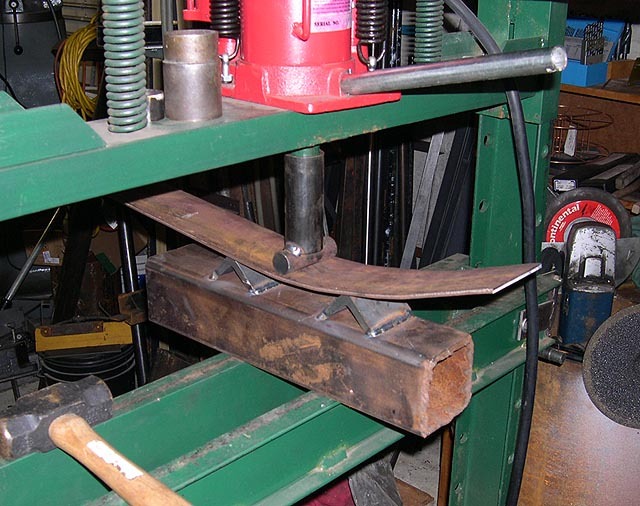 I made up a little bending jig for my press and bent a little, then moved the bar and bent a little more. Lots of trying it to fit the curve. Pretty quickly it fit "close enough". Remember, we aren't building Swiss watches here! I also tried bending it to the ID of a piece of scrap 24" tube I happened to have. In the end, I just used a combination of the two methods. One curved bar will yield quite a few patches. Have a look. In the first pic, you see the bent bar next to the paper with the printed-out curve.